Sadly, the core cast of Blake’s 7 is now missing a few members, with David Jackson (Gan) and Peter Tuddenham (Zen & Orac) having passed away, as well as the loss of Gareth Thomas (Blake) last year. Fortunately their characters can still live on forever in prose (and indeed, I understand that some of these stories have been repurposed from plans made before Gareth Thomas’s death). The stories in Heroes are set at different points in the show’s timeline, providing a just over four hours of action; some with Blake in charge of the Liberator and some with Avon. It is the early days of Series A and Cally is now onboard the Liberator. An outsider, as both a non-human and due to her telepathic abilities, the rest of the crew do not trust her and she is ill at ease too. Thrust into a mission with Blake, the pair teleport down to a planet looking for a group of scientists who fled the early days of the Federation… but all they find is a young woman. Told primarily from Cally’s point of view, this is a great tale which sees her finding her place within the crew, as well as observing first-hand the zeal with which Blake prosecutes his mission against the oppressive Federation regime. This tale of Avon, from the actor who played him, being lured in to meet an old frenemy one last time. As well as bringing his own character to life, Darrow has a great handle on Vila and Tarrant and provides a vivid little tale, which exudes a pure 1970s vibe and delivers a satisfying ending to boot. On the trial of a mysterious base within a nebula, Blake is after decommissioned ships he can use against the Federation. What he finds instead is something that holds the potential to be a far greater threat to them all. Being careful not to spoil this one, it is fair to say this is a cracking tale with plenty to do for all the characters. There is also the rare occasion of Avon seeming to care for something other than his own survival! It also ends on a lovely needling of Blake, and how his crusade might stack up morally. The potential of bringing out a defector brings Blake and Cally, sans Liberator, on a dangerous mission inside Federation space. This is another tense tale as we puzzle out the defector’s motivations and I enjoyed some of the more reflective moments between the pair. Responding somewhat tentatively to a distress call from a bleak planet, Avon, Tarrant and Cally find themselves trapped in a situation and up against a clock with the only Orac holding the potential to save them. But Orac does not want to. This is an involving tale, with a few dark moments and a great puzzle to solve as it becomes a battle of wits between the crew and Orac. With Travis still learning about Blake’s crew, this is a great tale of an attempt to steal the Liberator and, as the title suggests, has the whole ‘getting a gang together’ heist movie vibe as Travis recruits old friends and specialists. With information on the ship gleaned from the logs of the London, the prison ship right back in Space Fall, Gary Russell weaves a clever tale from the Space Commander’s perspective and gives us a flavour of what feels behind-the-scenes machinations with Travis and Servalan. We also feel compelled to give a nod to perhaps the most glorious, and simultaneously most unlikely Blake’s 7 story title ever! This is an entertaining bunch of tales about our flawed heroes and the decisions they make. We really feel Blake’s desperation to gain an advantage against the Federation and are moved to ask whether he considers the Liberator’s crew as friends, allies or weapons to be deployed? For Avon’s part, his paranoia and scheming is great fun, particularly when in tandem with (or should that be against) Orac. One character we would have liked to have more of is Gan. While there seems little point in recasting the role now for audio, given that the full-cast dramas are necessarily rooted in the Avon led era, it would be great to give him more to do in prose. Perhaps it is a thought for a further collection? To be fair, he is granted a fair slice of the action in Dominator. 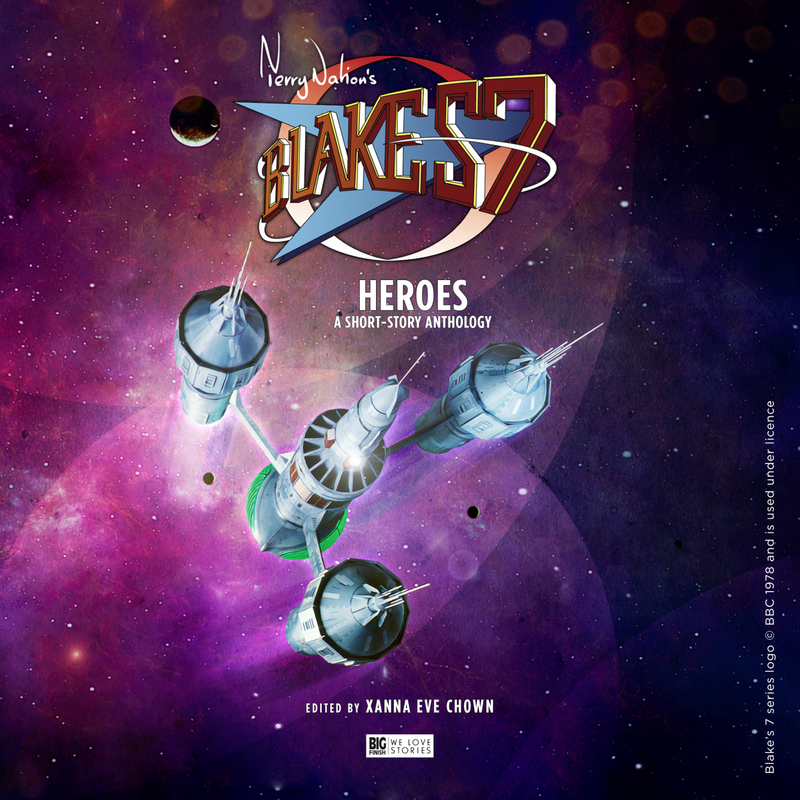 Blake’s 7: Heroes is available now as a digital audiobook at £9.99, or for those who prefer to do the reading themselves, it is also being published as a Hardback & eBook too.